Welcome (back) to the start of the academic year! Regardless of whether your student is new or returning, there have been a lot of recent changes in DICE that we would like to share. First off, DICE moved to a much bigger and more visible space over the summer. We now work on the second floor of Hemmingson right across from The Bulldog in rooms 213 and 215. All Gonzaga community members and their guests are welcome to hang out in the UMEC and LGBTQ+ lounges Monday through Friday from 9 a.m. to 5 p.m. DICE also has a new structure to streamline our programs and services and to better meet student needs. DICE is a campus department that encompasses the Unity Multicultural Education Center (UMEC) and the Lincoln LGBTQ+ Resource Center. UMEC began as the Unity House in 1997 when a student leader advocated for a campus department that could meet the needs of underrepresented students. While both Centers originated as a safe space and support system for historically underrepresented and traditionally marginalized student groups – and we continue to serve this very important role to this day – we also outreach and educate all students in their personal identity development, cultural fluency, and connection to social justice. We do this through our three pillars. Student participants are assigned a mentor who meets with them regularly and helps them navigate Gonzaga through BRIDGE and Act Six. As a Pre-Orientation Program that takes place the week before fall classes start, BRIDGE is a Social Justice & Leadership Institute designed for students who identify as first generation, low income, LGBTQ+, and/or students of color. Act Six provides leadership training and full scholarships for student leaders who will use their college education to make a difference on campus and in their communities at home. DICE hosts weekly co-curricular programs that focus on a social justice issue and highlights the experiences of historically underrepresented and traditionally marginalized communities. 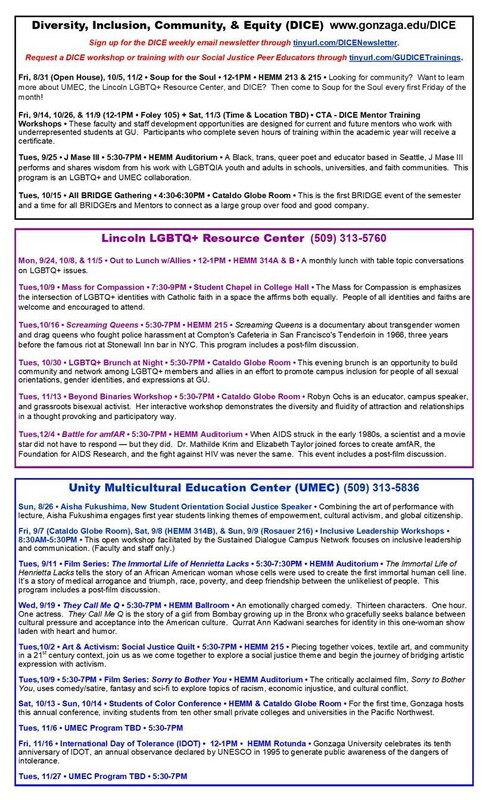 Our monthly programming series feature (1) Crafting Unity: Art & Activism Series, (2) Multiple Lenses Film Series, (3) Speak Up Series, and (4) Out to Lunch with Allies Series, whereas our annual signature programs focus on (1) International Day of Tolerance, (2) Diversity Monologues, and (3) Lavender Grad. DICE facilitates several opportunities to engage in diversity, equity, and inclusion topics with depth and intentionality as a way to increase cultural fluency. This includes facilitating Intergroup Dialogues, providing Safe Space training, hiring Social Justice Peer Educators in the residence halls, and funding students to attend diversity-related conferences outside of Gonzaga. 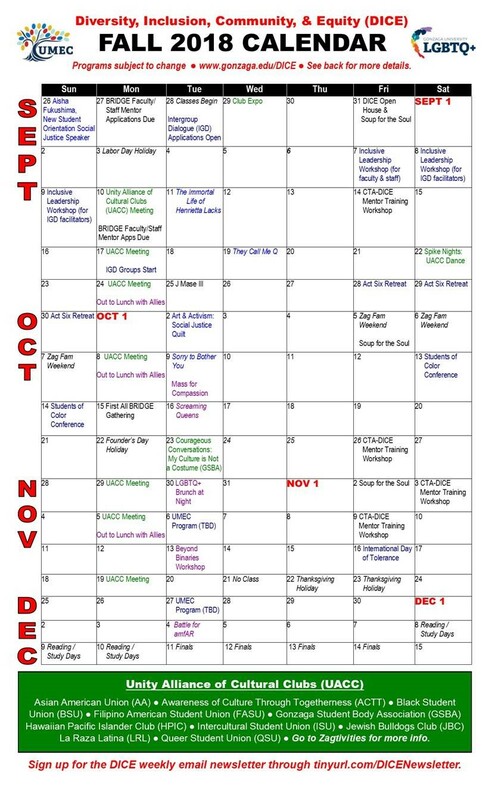 Please check out our fall calendar and sign up for our weekly DICE newsletter. If you have any questions or concerns, do not hesitate to contact UMEC at (509) 313-5844 / UMEC@gonzaga.edu or the Lincoln LGBTQ+ Resource Center at (509) 313-5760 / LGBQT@gonzaga.edu. Please see the calendar for more information. We would love your assistance in helping spread the word and hope to see your student at an upcoming DICE program!